Are They Made for You? Healthrider treadmills are mostly known for one thing... their features. And most of these feature rich treadmills are very affordable. So if you're on a limited budget, then this brand might be the one for you. The company became popular during the early 90's with the introduction of the original Healthrider. Today, their new lines of fitness equipment are based on the same unique concepts: innovative technology, easy-to-use, low-impact and enjoyable. That's what they say they're all about. Healthrider treadmills are made by Icon Health and Fitness. It has 4,800 employees and 10 manufacturing facilities in the United Stated, Canada and China. 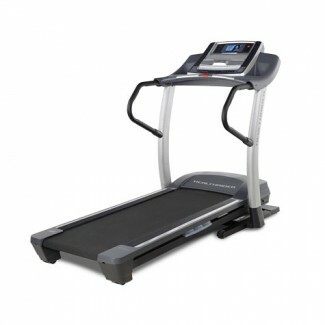 It is considered as the biggest manufacturer and marketer of treadmills in the world. Other brands created by Icon are Reebok, Weslo, Proform etc. Healthriders fall in the low to mid price range category. Most of its treadmills range from as low as $600 to as high as $1500 or above. So expect that the warranties they offer are proportional to its price. The lower priced models usually come with a few years warranty while their more expensive treadmills offer lifetime warranties on its motor. One of the biggest fallback of treadmills offered by Healthrider is that they are known more for their features rather than their quality. So don't expect these machines to last very long. In conclusion, I believe that Healthrider offers good treadmills. But I must say that there are other brands out there that would give you better treadmills in this price range. Check out our best treadmill page. If you still like to give HealthRider a try, I suggest you buy your HealthRider Treadmills directly from amazon. But before you buy, check out our reviews of individaul Healthriders below. It will guide you in choosing the best machine for you. Others: Nothing really special about this machine. This is just an average entry level treadmill. Others: This one is normally sold for $999 but it can now be bought for below $850, and at that price this machine is a great value. Below are some of the older treadmills from Health Rider that have been discontinued. I would keep the reviews here as most of these machines are still being sold by some websites or auction sites. Others: offers one of the biggest running decks below $1,000 during its introduction. Others: this was a beautifully packaged treadmill that falls in the mid-priced range category. Others: this was the most expensive Healthrider treadmill. Are You Using a HealthRider Treadmill? If you're using or have used a Healthrider, chances are visitors of this site would love to hear from you. It's fun, free and easy to do. Note: This site would no longer accept submissions that doesn't provide real value to other readers of this site.